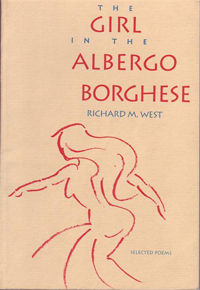 Selected poems by Richard West are collected in The Girl in the Albergo Borghese (1991). Bainbridge Island readers may recognize familiar landscapes and names woven into the poems, such as in I Lost it at the San Carlos Restaurant. James Bertolino characterizes West's work as follows: "If Bukowski had a Ph.D. in literature, he might write like Richard M. West. These poems, with their slant characters and jousts of dialog, are like mini-novels, full of humor and insight. Alert the book-burners, this one's dangerous!" West's booklet of poetry is part of the Bainbridge Public Library local authors collection.